Lendingclub has a new homepage. At least I think it is new, but maybe I have overlooked it for quite some time since Lendingclub used to point the homepage to the Lendingclub blog and I usually went directly to the blog URL. 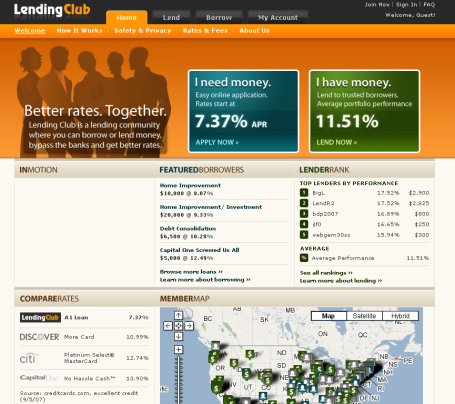 The homepage is mainly an information showcase for new borrowers or lenders. Unlike Prosper it has few real functions. While most data remains restricted to logged in users, it does show a few rankings and statistics. Today Lendingclub announced that it passed the US$ 1 million loan mark. With 683 verified lenders Lendingclub is still small compared to Prosper numbers, but growing steadily.